Discussion in 'Android Devices' started by dasudevil, Nov 6, 2010. Okay after reading for a few hours on the xda forum i have found a temporary root for the MyTouch 4G. This will help you remove some of the start up programs and applications you dont want including icons. * does not completely remove them but if you cant see it whats the difference right? 2. Titanium Backup: Free version works fine. Once installed you want to reboot the phone. 1. Open the phones settings and go into applications. Select development and check USB debugging. 3. Once installed, open Visionary and check ON Temp Root After Reboot, and check ON System R/W After Root. Then click TempRoot Now and wait for it to finish. Should not take long. You will see a BIG triangle. Then it will go to a black screen. Once that is done it goes back to options screen. 4. Once complete it may or may not bring you to the app drawer with a super user icon. I had to hit the home button to see. It was there... You can see in the photos i took. 7. All your applications should show up now and then one by one uninstall (free version) or FREEZE (paid) the apps you dont want or need. Rockband, Asphalt 5, Facebook, Yahoo crap, Monopoly. I did this 5 hours ago so please forgive me if i missed a step. 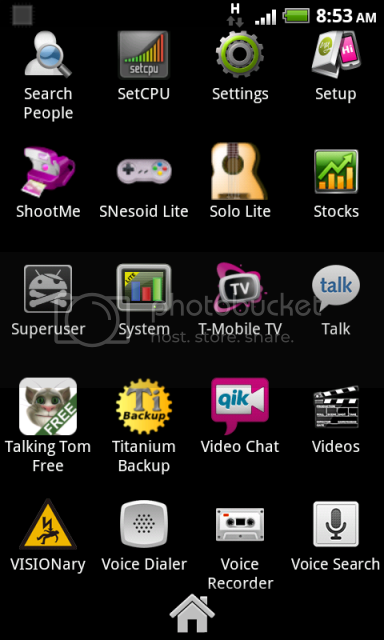 Pictures to prove im root... Hopefully you all know what apps are in the phone and i dont need to prove myself. This is not a permanent ROOT. Your phone will load back up to normal if you reboot. Credit goes to youtuber, XDA, VISIONary, Titanium Backup. pleaseno, LBSF, JF-08 and 3 others like this. update.... I rebooted today while at work and all the apps came back (working) and the root was gone. I just redid what i posted. Does not ruin your phone or brick if you dont remove any app that is tied to the phone functionality. Maybe soon ill make a video of my own from start to show you all. Wait so the Mytouch4G has the same issues as the G2 in regards to rooting? yeah this is a easy root.. i havent deleted any apps yet but i did restart the phone just to see if id lose root and the superuser icon remains on the phone but you do lose superuser access when opening a app that requires root.. just hit the visionary app again and it will root it.. took me about 10 secs at most and back in buisness. 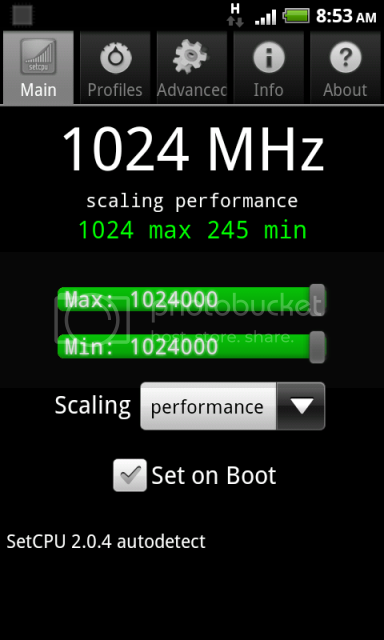 installed setcpu and cranked it up to 1024mhz.. nice! For those apps you cannot physically remove, you can disable with the stuff I posted from XDA-Developers such as the Stock Widget. Yes the exact same issue. The biggest difference is i actually feel confident about this type of rooting. On my MT3G i was scared like a little boy that just watched a scary movie for the first time. I have lots of posts in the MT3G section about that. THIS is EASY! yeah if you can download a app from the market, you can do this root. very easy! one thing to note on this if you force remove a app by long pressin ea app it will pop up a box allowing you to force remove at the bottom, this will actually fully delete the app from the phone but you will not be able to recieve any OTA updates once you do this.. supposedly if you just freeze the app you will still recieve any of the OTA updates from tmob.. IMO if you just run launcher pro as your default launcher you shouldnt really need to delete or freeze any apps.. mine still has all the stock apps and it runs pretty fast with launcher pro without any issues.. I did not know about force removing. I just hit it and did uninstall. Okay up and going... Yea much different start up. YEP root gone including all my apps to sd card. CRAP i need to marketplace that app i had to move everything over. Started up the Demo for asphalt.. Working perfectly. Nope no need to hunt things down in the market they were in different spots. LOL.. I removed so many icons it looks all different now. SO i can still receive updates from Tmobile and I dont loose any hard apps since they are locked into the actual boot sequence of the phone. I love this type of root. So simple yet so easy to unroot yourself when you feel froggy. ....off to root... 1 minute and DONE! now to "uninstall/hide" the start up crap apps. OOO the cool part is all the apps i constantly remove are all at the top and saves me time hunting them down. YEA love this root. im not 100% on this but i believe to freeze and force remove you need the paid version of titanium.. sorry didnt say that in the previous post.. uninstall doesnt remove them i believe..force remove is what removes them but again i believe you need the paid version to make that actually stick?? Word on the street is that permanent root has been achieved G2 rooted finally and MT4G as well. Word on the street is correct. Honestly ill be sticking with this type of root probably for a long time. I personally love the fact that its one button root and your not messing up the phone itself. I had lots of issues with my MT3G v1.0 and dont need to be doing all that over again with the MT4G. Edit: Just read up on the perma root process and it is NOT designed for the MT4G. Also looks like a pain in the rear if you dont know what your doing and even if you do. One mistype and your screwed. Once again ill be sticking with this type of temp root knowing im not screwing up my phone. days now without a issue so ill stick with this until they make a fairly easy one click type root that can be downloaded from the market .. the one just released still requires a little bit of knowledge of the phone and can be a little tricky if your not sure what your doing. Well of course with time there will be better root processes but this is perfectly fine for me. I'm able to change the CPU clock so I know I'm rooted. However I can't uninstall some apps. I go into settings and apps but the uninstall button is not highlighted. You will need to use the titanium backup for this. Once installed and ready just tap the one you want to remove and click uninstall. I used the free version so the hard copy is still in the boot loader and does not ruin the phone. also how do we get this to move over to the ROOT section now that we have one? I'm not sure if I follow. I have titanium back up installed and I ran it. It said all was fine. So not sure why the unistall button is not highlighted. Just to make sure I should be going into settings-app-and then select the app I Want to uninstall? Right? The only apps that are hightlighted for uninstall are the ones I installed. Sorry. Open up Titanium backup. There should be an overview section filled with mumbo jumbo. Then hit the backup/restore tab. This is where you uninstall. So lets select the rockband app . You want to tap that app section and then do the uninstall option. There should be a line that crosses it out. Go through and remove the ones you dont want. I did the obvious ones. It should reload your home launcher and BAM look for the app. Its gone. Its still there just no longer running and no more icons. I don't see anything here to uninstall. If I missed something well, thats my lack of tech skills. Your in the correct spot. Now tap one. A window should pop up and ask you to either, backup, freeze, uninstall, run app, wipe data. Choose uninstall. The list is long so be careful. One I press one of those in the list. I get backup, freeze, un-install,, restore and delete. I don't see run app, wipe data. Freeze and uninstall are not highlighted. I can only choose from the other 3. I think there is a permanent root instruction over at XDA but I am not an expert so did not do it. dasudevil: What theme or how you did so all programs listed so nice as pictures shown? So what are the *official* list of apps that can be safely removed without screwing up the phone? My phone is permarooted and I have a ClockworkMod backup in case something goes wrong, just want to make sure. Thanks.